This is best done outside to avoid getting silks all over your kitchen. Gather extra help for this step. Younger kids like husking corn and older kids should all experience the joy of finding the occasional worm. I like telling my teens about how corn huskings were important social events in the olden days. It makes them more appreciative of movies and Facebook. 2. Scrub the ears in cool water. Use a vegetable scrubber to remove the silks. If there are any bad spots, cut them out with a knife. Place the ears in a pot filled with boiling water and cook for about 2 minutes. You will need to do this in batches. 4. Cool the ears to stop the cooking process. Fill a freshly scrubbed sink with cool water. Use tongs to move the corn from the boiling water to the cool water bath. 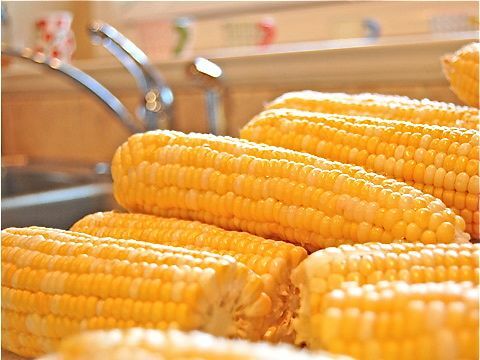 Remove the cobs from the sink and allow to drain in a scrubbed dish drainer or on clean towels on the counter. 6. Cut the kernels from the cob. 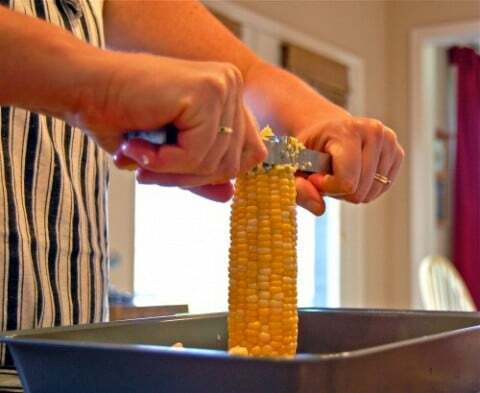 Use a sharp knife, electric knife or corn cutter gadget to remove the kernels. 7. Fill zip top freezer bags. I froze mine in 2 cup quantities. For my family of 6, I’ll need two of these bags to make a side dish. Lay the bags flat in the freezer. This makes them easier to store and quicker to thaw. I put up 2 dozen ears of corn and it yielded 8 2-cup bags for the freezer.